“The Jews shot me.” I was eating breakfast with 3-year-old Ibrahim Awajah in February 2015, in the northern Gaza town of Beit Lahia, when he made this proclamation. His father, Kamal Awajah, saw the surprise on my face. Fadi Abu Shammala in Gaza contributed to this report. The first Ibrahim, 9 years old, had been shot and killed by an Israeli soldier during the 2009 attack on Gaza, which the Israeli military named Operation Cast Lead. His parents and siblings witnessed the killing, along with the demolition of their home. The second Ibrahim, born in 2011, was named after his martyred brother. He has already lived through two massive military campaigns. He has also lived most of his young life in tentlike structures, first while his family’s house was being rebuilt after Operation Cast Lead, and then after it was destroyed again during the summer 2014 war. Israel launched its Operation Protective Edge on July 8 last year; its stated aim was to “restore calm to southern Israel” after an increase in rocket fire emanating from the Gaza Strip. The 50-day onslaught left 2,131 Palestinians dead, of whom roughly 70 percent were civilians, including 539 children. Hamas forces in Gaza executed at least 23 alleged collaborators with Israel. Seventy-one Israelis (66 of them soldiers) were killed during the same period, including one 4-year-old boy. 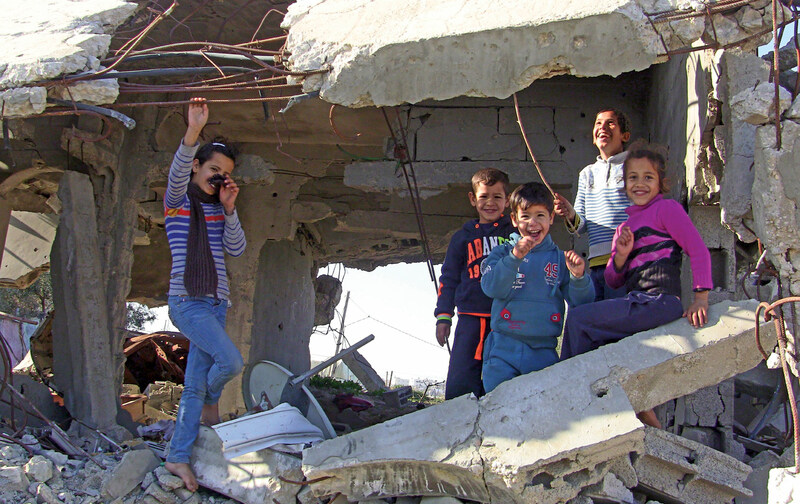 Over 16,000 housing units in Gaza were demolished or severely damaged, leaving nearly 118,000 people homeless. The Awajah family is still among them. Though many of the damaged houses have been repaired a year after the war, not one totally demolished home in Gaza has been rebuilt. In a February 2015 report, UNICEF estimated that nearly 300,000 children—approximately one-third of Gaza’s youth—were still in need of psychological and social support six months after the war. I was sitting with Dr. Jamil Atti, Gaza’s country director for the Center for Mind-Body Medicine, in his living room in Gaza City. “When you talk about ‘post-traumatic stress disorder,’ there should be a ‘post,’” Atti said. “And in Gaza, there is no ‘post.’” His face was lit by a cellphone’s flashlight; the power had cut out minutes earlier. Six months after the cease-fire, Gaza was receiving only six hours a day of electricity, due to the damage that its only power plant sustained and the ongoing Israeli blockade, which was imposed when Hamas took charge of the coastal enclave in 2007. As of April, electricity had resumed an eight-hour-on, eight-hour-off schedule. The Israeli military demolished 20 schools in Gaza during the war, including 11 kindergartens, and 450 other educational facilities were damaged. Among them were three United Nations schools turned shelters; 44 displaced Palestinians were killed in the attacks. A United Nations inquiry found that three empty UN schools had been used by Palestinian militants to store and fire weapons—but not the ones sheltering the displaced families. Kahaman’s young charges, ages 3 to 5, huddled together on a plastic mat and stared at me. Nearly every pupil had been directly affected by the war: either a family member had been killed or injured, or they had been forced to flee their home. The children’s colorful Dora the Explorer and Hello Kitty backpacks contrasted sharply with their eyes, which looked dulled, as if covered by a thin veil. The missile lay near their feet. “Some of the children are aggressive, hitting their classmates, smashing things in the classroom,” Kahaman said. One previously joyful little boy now cries for his parents all day. The courtyard beyond the preschool’s missing back wall was filled with debris. One boy stepped through the nonexistent wall and picked up a small chunk of concrete. He carried it back, nestled it firmly in the sand, and returned to select another. A classmate leaned outside and grabbed her own jagged concrete block. Within minutes, all the children were silently building towers from the rubble of their demolished nursery school. Yousef Ahmed is a stocky, blond primary-school teacher in the eastern Gaza City neighborhood of Shejaiya. “The most brutal of the three wars was last summer’s. The kids suffered a lot,” Ahmed told me. I had already seen the appalling aftermath of the four-day Israeli campaign in Shejaiya. Whole areas were devastated; not a building in sight was habitable. F-16 fighter jets had flattened some buildings, multiple stories stacked like pancakes. Tank and mortar fire had blown out the walls of others, leaving their frames intact. A twisted staircase hung from the ceiling of a three-story apartment building, connecting to nothing. Family killed by F16 USA was spray-painted on one shell-pocked wall. Young men loaded donkey carts with rubble, slowly clearing the mounds of war debris. The Child Protection Rapid Assessment Report (CPRA), published in October 2014 by the Child Protection Working Group in Gaza, supports Ahmed’s observations. Without exception, everyone surveyed for the CPRA noticed significant changes in behavior. Boys were more likely to demonstrate aggression, while girls were more likely to exhibit general sadness, crying, nightmares, and bed-wetting. Ahmed also observed an impact on his students’ ability to learn. “They have weakness in memory, scattered attention, and decreased concentration. They absorb less material. They lack a desire to learn.” They also lack proper conditions to study. “I can’t tell a student to do his homework when I know that the electricity is out,” Ahmed said, “or the student can’t buy notebooks and pencils, because his father doesn’t work.” According to the World Bank, Gaza’s unemployment rate—43 percent overall and more than 60 percent for youth—is one of the highest in the world. Ahmed’s school, though still functioning, was among those shelled. The school next door to his was demolished completely. “The kids there were distributed to other schools,” he said. Leila Al-Hilu showed me a cellphone video of her twin 6-month- old grandsons, Karam and Kareem. Dressed in matching green outfits and propped in an overstuffed armchair, the babies babbled to each other, grabbing hold of each other’s fingers. Aside from the crop of curls atop Karam’s head, they looked identical. “The video was taken one day before they were killed,” Leila told me. Leila sifted through a stack of photographs of her deceased loved ones, muttering “God’s mercy on them” as her husband, Talal, recounted what had occurred at approximately 3 am on July 21, 2014, in Shejaiya. Seven Israeli soldiers had been killed, and a night of intense shelling had followed, in revenge, many in Shejaiya believe. Leila was preparing the predawn Ramadan meal when Talal’s brother Jihad, who lived just across the road, phoned to check on the family. Minutes later, F-16 fighter jets shot two missiles into Jihad’s house. When I asked him what does he feel as a father, Talal replied: “What can I do, as a father? There’s nothing I can do.” This is a common emotion among Gaza’s adults. “Parents cannot protect their children,” Dr. Atti said. “And the children understand and feel that. The parents themselves are constantly afraid.” This fear is compounded by a pervasive uncertainty—whether there will be another war, when rebuilding materials will arrive, how many hours of electricity or water will they have, whether their cooking gas will last the month. “The prolonged siege and consecutive assaults deplete people of their natural protective resources, their stress mediators, and their ability to cope with difficulties,” Dr. Abu Jamei explained. I first met Ahmed Abu Hatab, from the Khan Younis refugee camp in southern Gaza, in 2001, when he was an 11-year-old boy with a love of magic tricks and an irrepressible grin. There was no flicker of that grin when Ahmed met my taxi. He graduated from university with a degree in information technology five years ago, but he cannot find a job. “No work. No electricity. No hope. No future,” Ahmed said. When I asked the family what could bring hope, the answers came piling on: Open the gates. End the siege. Build an airport. Be permitted to visit Al Aqsa in Jerusalem. Have rights like other people. Leila al-Hilu is an example of this. Immediately after the war, she began sewing dresses free of charge for the little girls in the neighborhood. “It helps me compensate for my loss and my lack of emotions after my daughter, granddaughter, and the twins were killed,” Leila said. And as precarious as the future is, the eldest Awajah child is planning for hers. Omsiyat, 17, completed her final high-school exam on June 17 of this year. She plans to enter university in the fall to study journalism.